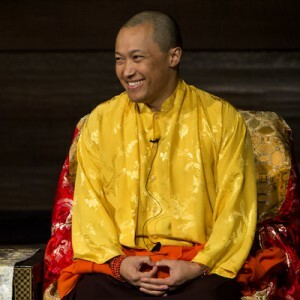 As the busy summer program season begins, Sakyong Mipham Rinpoche will visit the Boulder Shambhala Center to offer a public program for new and experienced meditators called, “The Shambhala Principle: Rising to the Challenge of our Times,” on the weekend of June 13th – 15th. The Tibetan meditation master and founder of Naropa University, Chogyam Trungpa Rinpoche, offered the modern world the Shambhala vision of enlightened society. The underlying principle of this vision is the inherent basic goodness of humanity. More than simply a hope for the future, Shambhala vision is also a practice or a way of rising to the social and ecological challenges of our time. The Shambhala principle allows us to summon the innate potential of both personal and collective wisdom. Practicing meditation is both a means of personal transformation, but is also a way to shift deep cultural assumptions about human nature. When we extend our meditative experience, we open ourselves to the possibility to engage in contemplative conversation. In this way, we can practice the three levels of social transformation: personal, interpersonal (relationships), and collective (societal). At the program in Boulder, the Sakyong will be joined by two of Shambhala’s senior teachers, Acharya Dale Asrael and Shastri Ethan Nichtern. The program is open to new and experienced meditators alike, and we invite everyone to join us. To learn more and to register, please visit the Boulder Shambhala Center website: www.boulder.shambhala.org, or call 303-444-0190.